Those who follow this blog know that I do not believe in death. That doesn’t mean I don’t take it seriously. It doesn’t mean that when my husband died, I wasn’t brought to my knees in grief, or that I do not miss him every day of my life. That is why, this past week, when I learned that my friend’s husband had died, my heart broke for her. I feel her grief, just as surely as I felt my own, because death on this earthly plane is very real. When I say I don’t believe in death, it’s true. I don’t. I believe the person I love who left his body still lives. The person. Not the body. Over the years, I have felt the presence of those, like my son, like my husband, like my mother, who have “died.” I have experienced things beyond the human senses. I have had evidence, signals of their presence. Christmas ornaments falling from a shelf. A ring, long put away, suddenly appearing on the floor of the laundry room. The presence of a Spirit Guide, come to help me and teach me about life, and life, and life. I know the ones I love are here. They’re here when I am not feeling well, here when I see something extraordinarily beautiful, here when I think of them or call their names. Here when I dream of them. But my husband’s eyes, the blue, blue eyes that looked at me with such love, are gone. We, my friend and I, have lost their eyes. We have lost their laughter, their wisdom, the gentle kindness with which they shared our hurts and fears. They loved us, and the loss of that present love is real, and painful, and lonely. There will be times when we will say that we “lost” our husbands, but it is not they who are lost. We are. I’m still amazed at how my mind was working in those last days. As long as my husband was breathing, my mind kept death away from me, away from him, away in spite of all the odds, away, even as cancer progressed in the relentless pursuit of his life. My mind did that for me.We did not think about death. The body we loved still breathed. We were busy taking care of it. And that was enough. My friend and I knew what it was like to care for the body. We talked about it. We knew what it was like to handle urine and feces, and all manner of bodily manifestations. Nothing was repugnant to us. Nothing. Because love was greater than anything the body could show us. And in my mind, as long as I could keep doing those things for the body, death did not exist. Until it did. And he no longer needed me. That was, perhaps, the deepest shock of grief, the moment when he no longer needed me. Or anything. Or anybody. And so, my dear friend, I do acknowledge death, even as I give it no lasting power over the ones we love. I acknowledge our loss. It is as real as this earth, as real as time and space, and as the pain we feel. It is as real as the relief in knowing they no longer suffer. It is as real as our moments of anger at them for leaving us, as real as the clothes that still hang in the closet, the shoes that are worn in the shape of their feet, the faint scent of cologne on the shirt, the phone that we will throw away. The light that we must now leave on so that we will not come home to a dark house. And there is something else that is real, and that is our love. It does not die. And that is where they live, my friend. They live in every memory, in every pain, in the dreams we have in which they are still with us. They live in radiant, beautiful spirit. In another dimension, but here. Now. They come near to us and somehow we know it. We feel it, because their love, too, does not die. It is the language with they they speak to us and the energy with which they make themselves known. You will feel it. Perhaps you have already. And you know, dear friend, or you will know, that Nobody’s Gone for Good. I have an old black and white photograph of my son Eddie and his “girlfriend” Kelly. 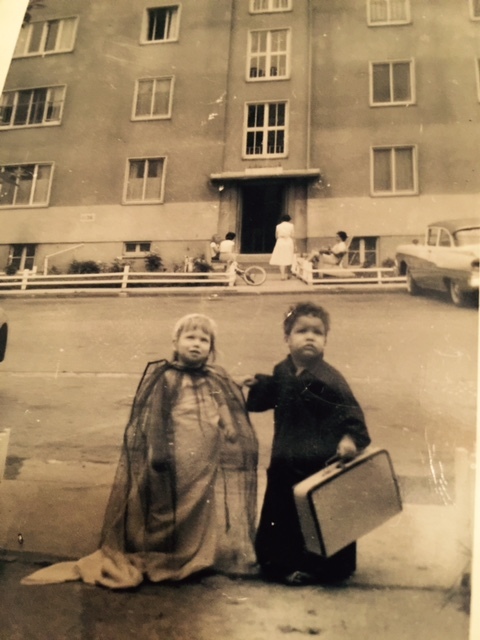 They are about two and a half years old, standing in front of our living quarters on an army base in Germany. Their older siblings had staged a wedding and somebody with a camera caught them as they were about to leave on their “honeymoon.” Eddie is holding a suitcase and Kelly is still in her wedding dress. Eddie died on September 23, 1979, exactly one month before his eighteenth birthday. The anniversary still has its impact on me and Debbie, Niki, and Michaela, my daughters. Wherever we are in the world, we call each each other on September 23rd. We will again this year. His sisters probably remember him better as a teenager, but this is the way I see him – a toddler, marrying Kelly or laughing, jumping up and down on my lap, his chubby little arms around my neck. I can still feel his little embrace. This is the way he comes to me. I do not know whether this is his choice or mine, but when he comes, he is always in my nest, in my arms. No matter what the subject matter, I write this blog every Sunday for those who have “lost” someone they loved, especially for mothers who have lost children. I write it and I wrote my book because I survived, and my story may offer a measure of comfort to those who have not yet found it. I will not tell you that I never cry or that I do not miss my child every day of my life. I am changed forever. But I cannot drown in grief and self-pity because Eddie does not allow it. He insists on coming to me, his little arms stretched out, the light of joy in his eyes. Nobody’s gone for good, Mom, he says, smiling. I hear you, Eddie, I say to him. I hear you. 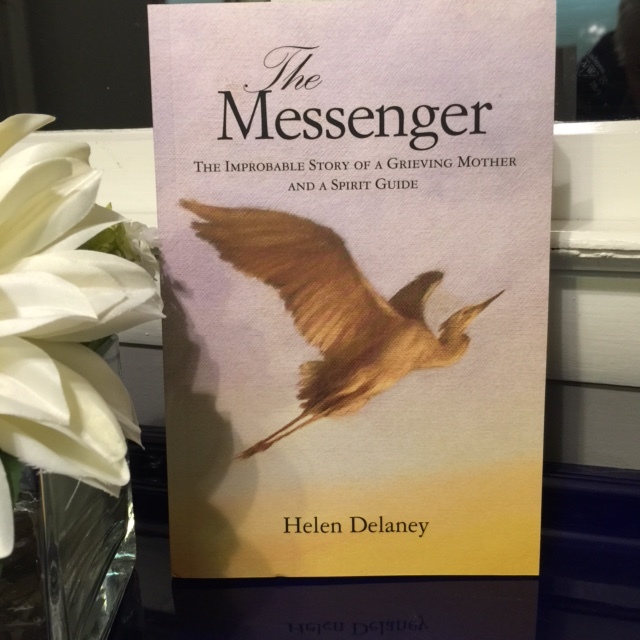 The Messenger: The Improbable Story of a Grieving Mother and a Spirit Guide by Helen Delaney is available on http://www.amazon.com. It is also available at the News Center in Easton, MD.